This site is dedicated to the lives of the ancient Egyptians, from as early as the pre-dynastic times, right up until the time that Christianity came to Egypt. The Dynastic period of ancient Egypt lasted for more than three-thousand years, and during this time the ancient Egyptians became great influences on the cultures of their time. The ancient Egyptian's medical treatment influenced the Greek doctors that flooded into Alexandria to learn the ways of the Egyptian doctors, as well as the Greeks also being influenced by the Egyptian art and architecture. Some of the art that the Greeks took to their own land from Egypt, was even later incorporated by the Romans, such as styles of columns. Their religion made its way into Nubia where pyramids were built, and cults like that of the goddess Aset (Isis) made its way as far north as the city of York in Great Britain. 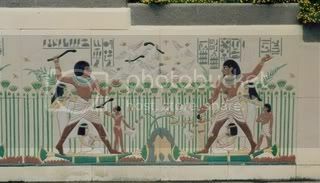 These influences, and many more, made Egypt a very important land in ancient times. This importance was enforced upon many cultures by acts of military campaigns, where the Egyptians expanded their land from as far as, south of the fourth cataract in Nubia, to north of the Euphrates River. This expansion was conducted during the reign of Djehutymes III. Credits - Henutmira picture supplied by Gary "Karl" Bogg.